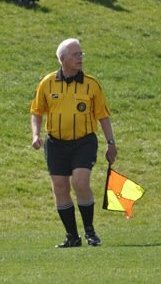 The Larry Smith Memorial Referee Fund is to assist referees who cannot afford the tools to do their job to the best of their ability. 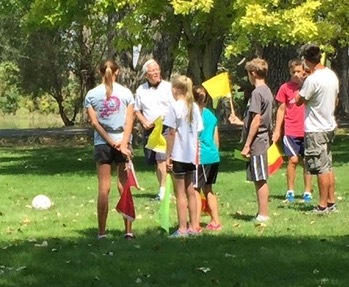 It is especially designed for those youth referees who demonstrate love for officiating soccer, kindness, courage; currently officiate recreational and or competitive league and Cup games for Colorado Soccer Association and are not able to afford everything they need to be successful as referees. More often than not, new referees are encouraged to start with the economy packages, and one or two basic jersey colors, then gradually purchase additional gear, as the income begins to roll in. Since many youth referees are still playing their own games, busy with school and church, it takes time to acquire all the gear to make their job easier. In theory, all referee crews should match when working a game together. In a perfect world, there should be 5 colors on the field, meaning Home Team, Away Team, Home GK, Away GK, and Referee Team. Many new referees find it too expensive to purchase all the gear required to perform their new job. When Larry was on the field mentoring youth referees, he would often run across a referee who only had one jersey color, either forgot their watch, or could not afford one, and those who improvised and used their cell phone to keep game time. Larry was always there to lend a hand, and to make the new referee feel confident, so the referee could concentrate on player safety, and a level playing field. 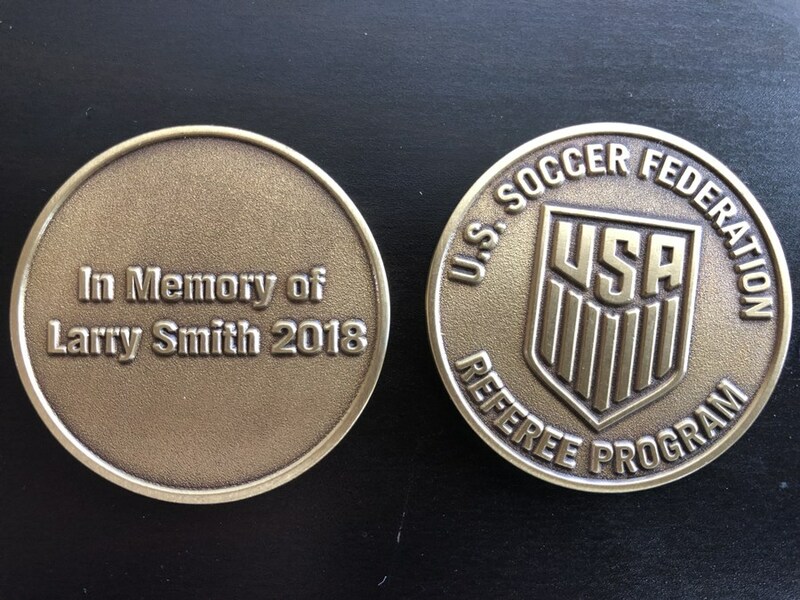 Larry Smith Commemorative coins will be available at the AGM, or by contacting Kim Park at kimpark@playthewhistle.com, or 303-550-6703. Minimum suggested donation to the Larry Smith Memorial Fund for each coin is $10.00. Current supply is limited. Checks or cash is accepted. Checks should be made payable to CSA with Larry Smith Memorial Referee Fund in the memo line. Pro Shirts (All Large) - Minimum $35.00 Bid for each shirt. For more information about any of these items, contact Kim Park (kimpark@playthewhistle.com), 303.550.6703. You can be part of keeping Larry's legacy alive by donating to the fund. Do you (or someone you know) need help getting your referee gear?